Chlorophyll is essential in photosynthesis, allowing plants to absorb energy from light. Magnesium occupies the central position of the chlorophyll molecule, the green pigment which enables the plant to utilize solar energy for the production of organic matter (figure 1). It is, therefore, not surprising that an adequate Mg supply to the plants may act as an activator of important enzymes in phosphorylation, the fundamental process of energy transfer in the plant. 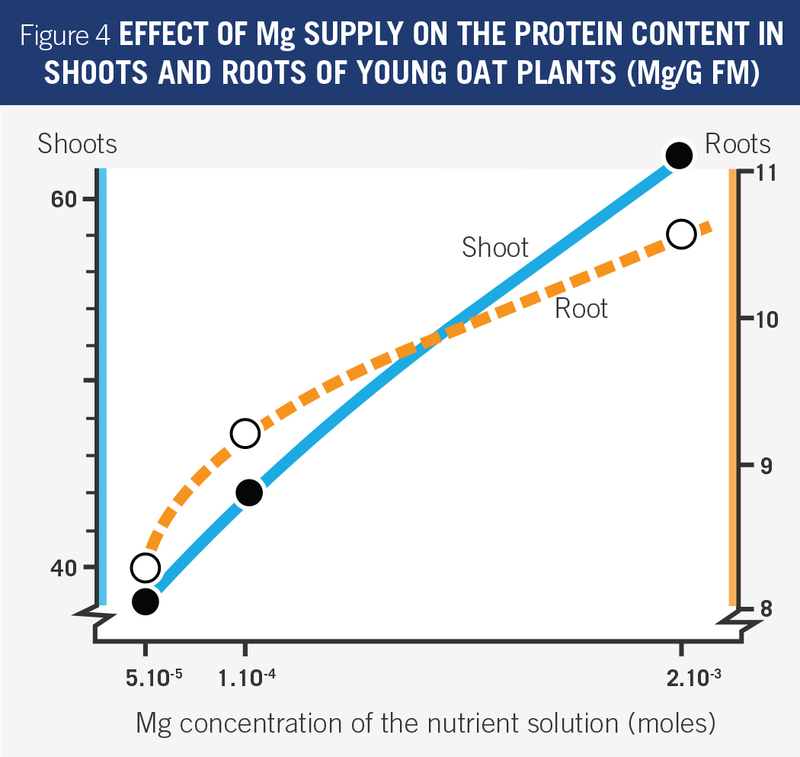 The involvement of Mg in the formation of protein is illustrated in Figure 4 which shows the protein content of young oat plants as influenced by Mg supply. Although the parent materials of some soils may contain very high amounts of magnesium (e.g. basalt, peridotite and dolomite), the total Mg contents of most soils are rather low, namely between 0.05% and 0.5% Mg . Of this amount only a fraction is easily available to the plant, i.e. the magnesium present in the soil solution and the exchangeable Mg absorbed to clay minerals or soil organic matter. 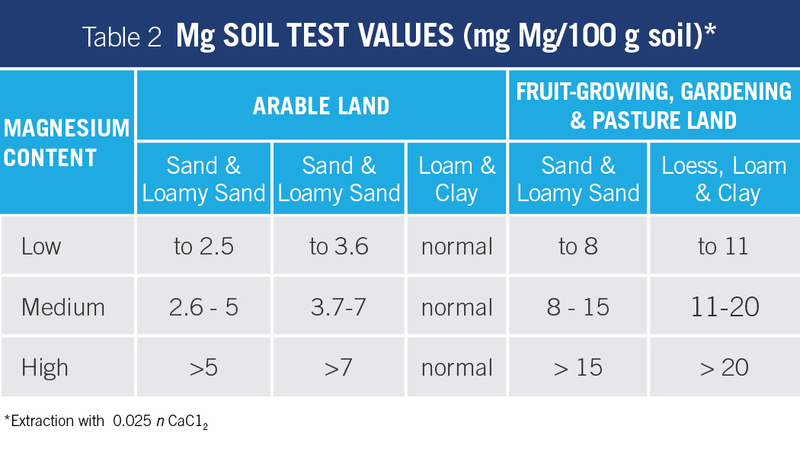 High levels of Mg are found in some saline and alkali soils and in soils with a high content of magnesium carbonate. But many of the agricultural soils are low in exchangeable magnesium, particularly those in the humid zones of temperate and tropical climates. High rainfall and soil acidity together with low cation exchange capacity increase the mobility of magnesium and cause heavy losses by leaching. Under these conditions the Mg status of the soils is poor. In tropical Latin America, for instance, 731 million hectares are deficient in magnesium (or 49% all soils) mostly classified as Oxisols and Utisols (Ferralsols & Acisols according to the FAO-UNESCO soil map of the world). In Brazil, Mg deficiency symptoms on annual crops have been recorded as frequently as potassium deficiency. In the humid tropics and the wooded savannah of Africa, the soils with low base status which are presently or potentially deficient in Mg cover 44% of the area. In tropical Asia, they amount to 59%. 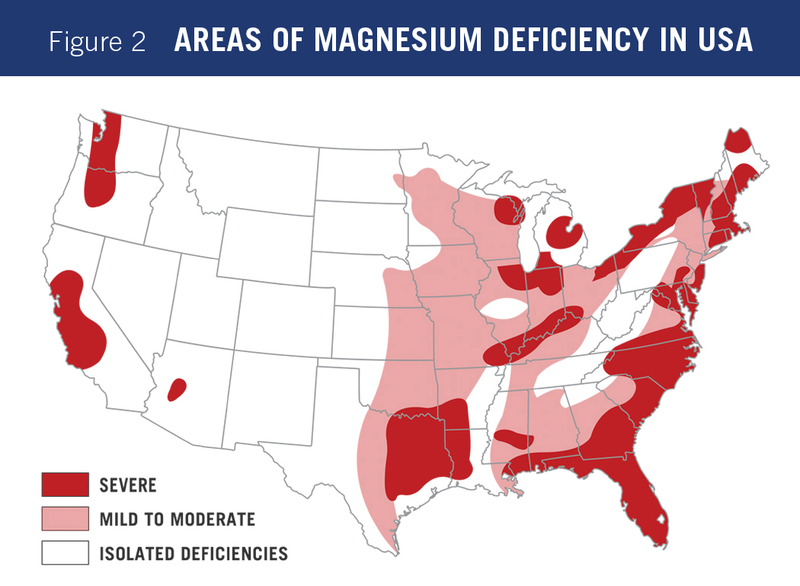 Mg deficient areas in the USA are shown in Figure 2. Usually, soils are considered deficient in plant available magnesium when the content of exchangeable magnesium is below 3-4 mg/100 g of soil. The critical values differ according to the soil texture. They are higher in soils with high content of 2:1 layer clay minerals and high organic matter. An example of Mg soil test rating for the Federal Republic of Germany is given in Table 2. As for other plant nutrients, the status of available magnesium in the soil cannot be considered independently. It is influenced by the contents of other cations, such as calcium (Ca) and potassium (K), and by the soil acidity (pH). 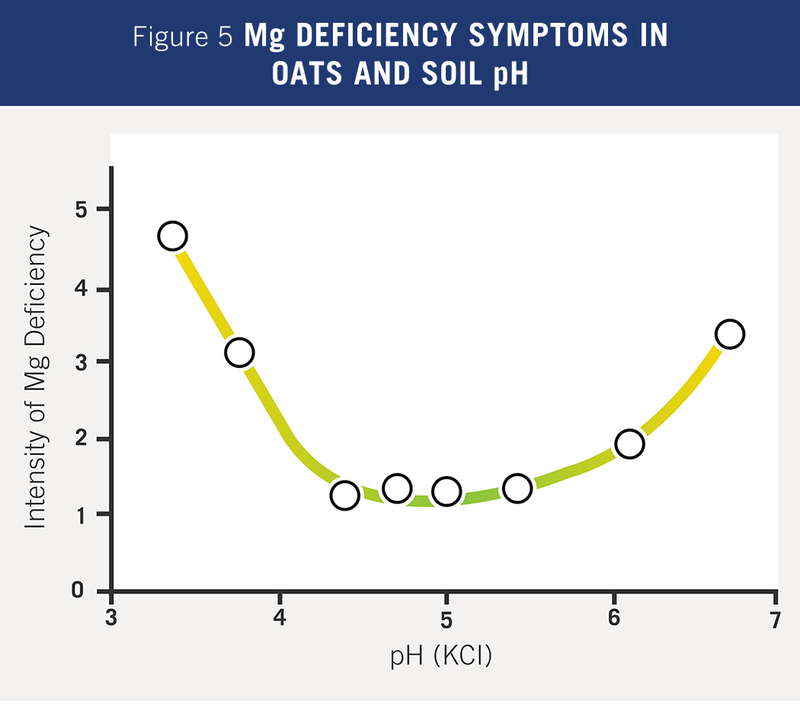 The relationship between Mg deficiency of oats and the pH of sandy soils is illustrated in Figure 5. The occurrence of Mg deficiency symptoms was lowest at about pH 5, indicating an optimum of Mg availability at this pH range. At lower pH, the uptake of Mg is reduced due to the increased concentration of hydrogen (H) and aluminum (al) ions. In very acid tropical soils, mainly formed by sesquioxides of aluminum and iron, the addition of magnesium fertilizers to the soil reduces Al toxicity. At high soil pH, the competition of Ca ions is responsible for the lower Mg uptake. Regardless of the PH, ammonium (NH4) and potassium (K) affect the uptake of magnesium. Thus, heavy dressings of ammonium sulphate or potassium chloride can aggravate Mg deficiency. 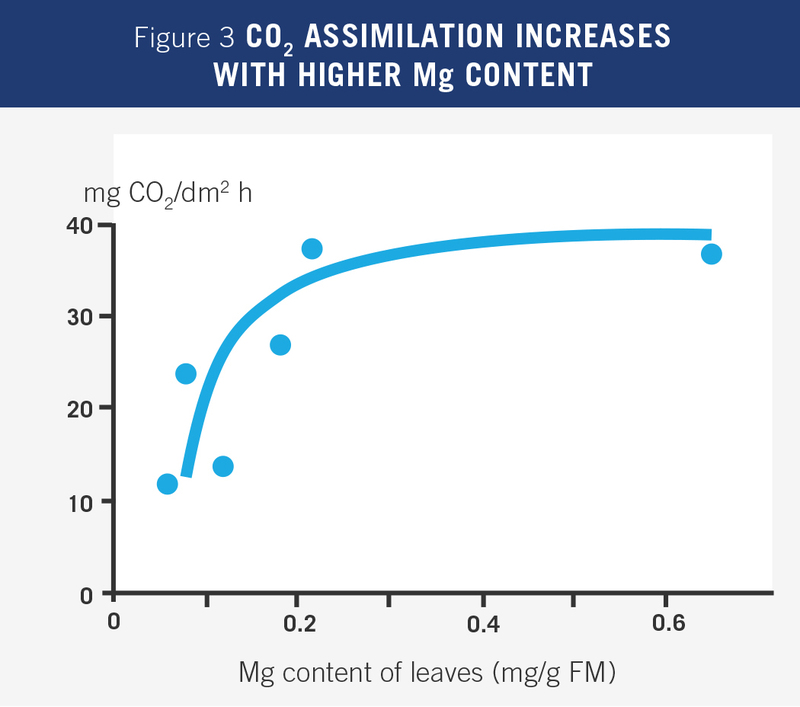 Plants take up magnesium in smaller quantities than potassium, although the contents of exchangeable Mg in the soil and the Mg concentration of the soil solution are often higher than the corresponding values for K. There is antagonism between K and Mg but it seems to be confined to the deficiency range of nutrient availability. Under such conditions, increasing the supply of one nutrient aggravates the deficiency of the other. 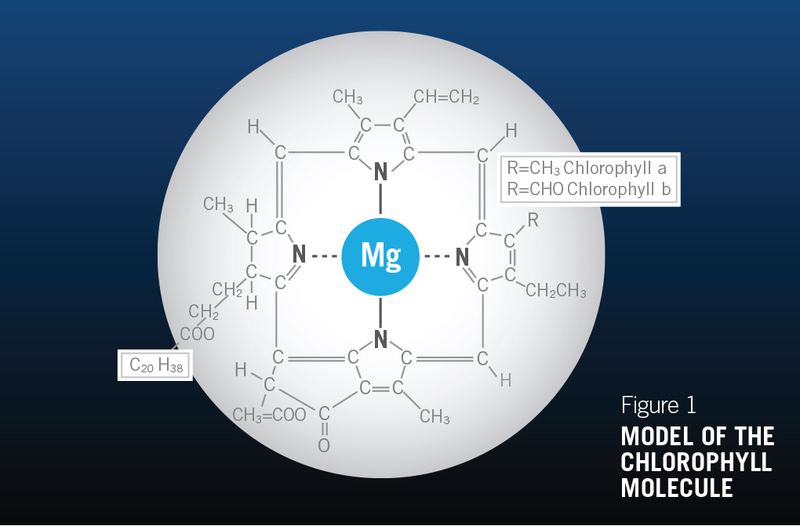 Usually high contents of Mg can be found in plants deficient in K (plants try to keep the sum of the cations K, Ca, Mg, Na fairly constant). Application of potash fertilizers to correct K deficiency leads to a gradual decrease of magnesium contents in the plant. 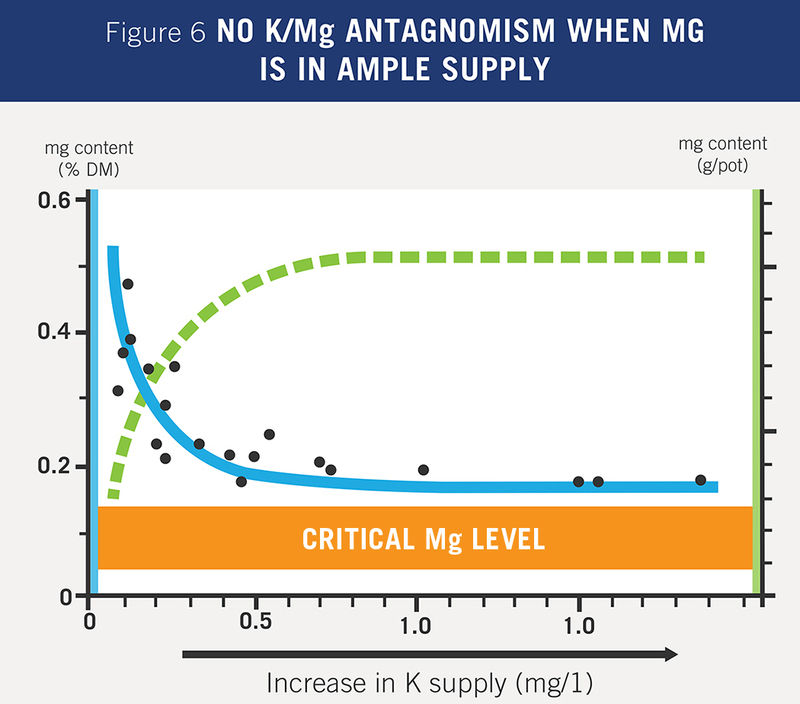 Provided that the soil is well supplied with available Mg, leaf magnesium will not fall off to dangerously low values but remains above the critical level even at the high K rates needed to exploit the genetic yield potential of the plant (Figure 6). 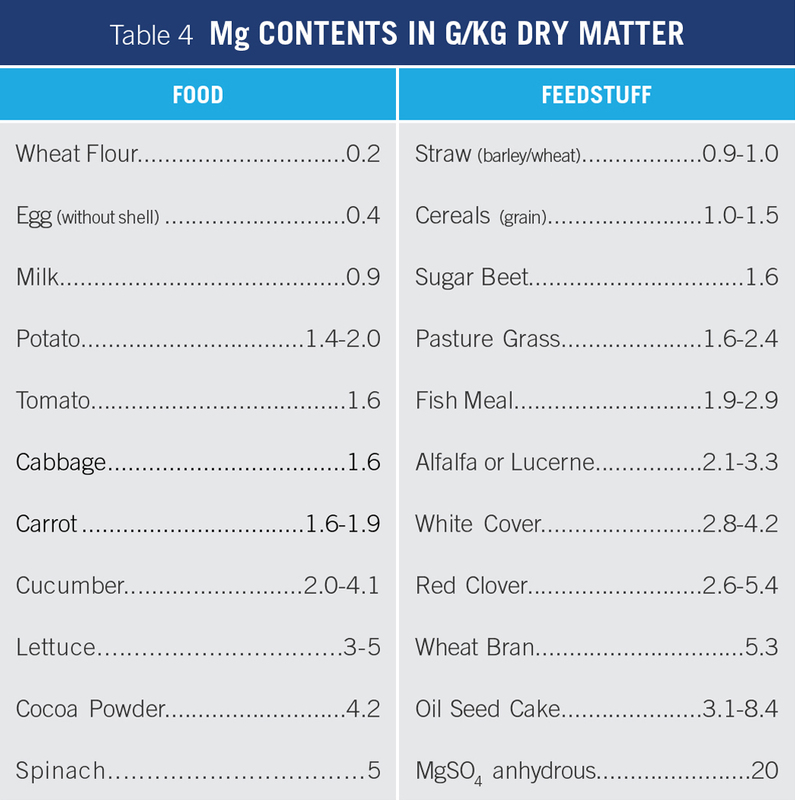 When both K and Mg are deficient, it is advisable to improve the magnesium status of the soil by adequate Mg fertilizer dressings before applying heavy doses of K.
Magnesium deficiency symptoms are more and more observed not only on Mg defined soils but also on soils originally well supplied with this nutrient. This is due to higher Mg uptake by high yielding crops under intensive cultivation. If the requirements are not met by the magnesium supply of the soil or by the application of Mg-containing fertilizers, plants will suffer from Mg deficiency and may show deficiency symptoms at various growth stages. 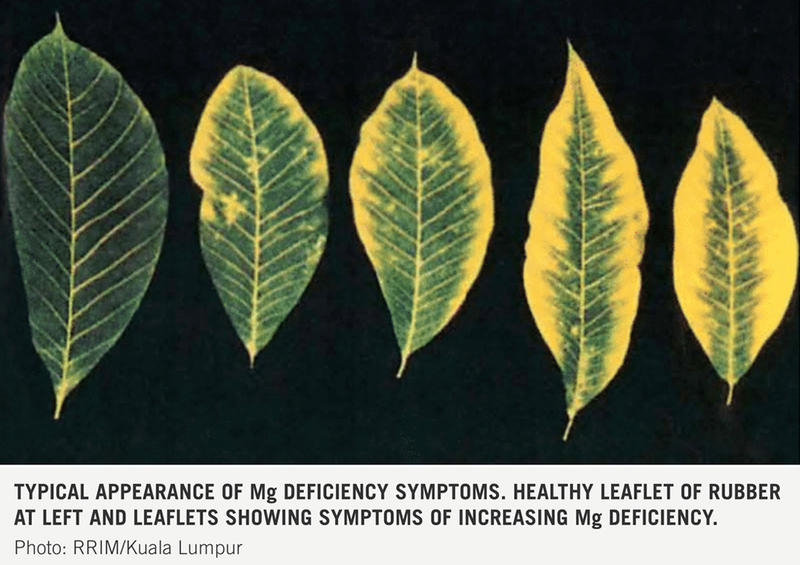 As magnesium is rather mobile and can be easily transported to the actively growing plant parts, Mg deficiency generally first becomes visible on the older leaves. Although the symptoms differ between plant species, some general characteristics are apparent. Mg deficiency becomes manifest by pale discoloration of the leaves in part or as a whole (chlorosis) while the veins remain green. 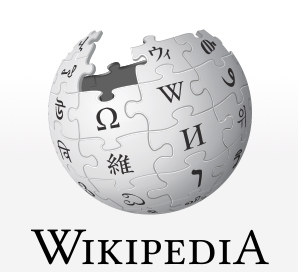 At a later stage the color of the affected areas changes to yellowish white; they become translucent and then take a dark color and eventually die (necrosis). In most cases the leaves are brittle and premature defoliation is observed, especially in fruit trees. 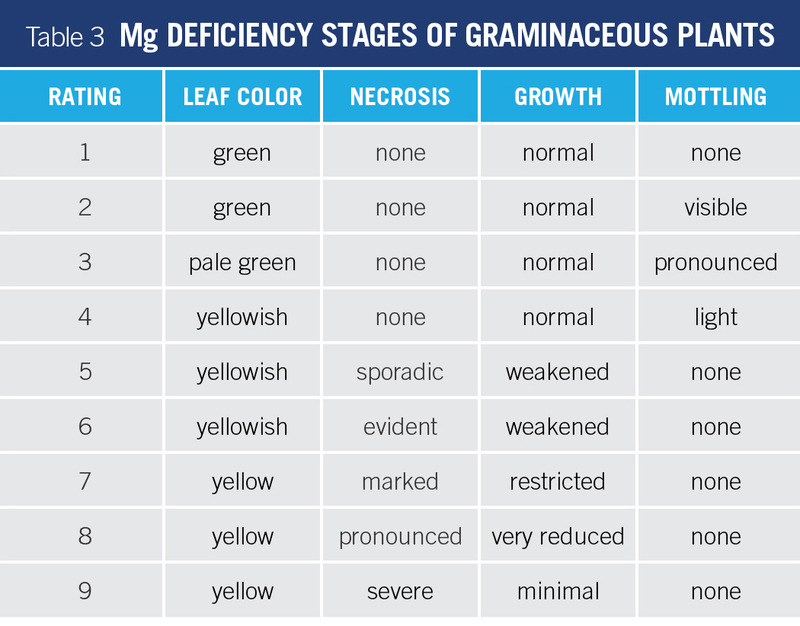 For graminaceous crops, ratings of Mg deficiency symptoms have been established as given in Table 3. Magnesium plays an essential role in the human and animal metabolism. It is a constituent of many enzymes, the key substances that regulate the life processes in the cells and organs of the body. Too low a Magnesium supply may lead to tetany (e.g. grass tetany, a lethal disease of dairy cattle), brain disturbances, muscular cramp, and eventually heart diseases. Magnesium deficiency can be avoided if a food source contains sufficient Magnesium. The daily requirement is about 0.3-0.4g of Magnesium for an adult person. The magnesium needs of animals differ greatly. A dairy cow may require 3-6 g of magnesium per day, depending on the level of milk production. However, as the utilization of the magnesium contained in the forage is rather low (in young pasture grass only 10%), the actual quantity needed may become as high as 50 grams of magnesium per day or more. To assure an adequate supply of magnesium to dairy cattle, the forage should contain sufficient magnesium, at least 2 grams of magnesium per kg dry matter. The average Magnesium contents of some food and forage materials are given in Table 4.